“Once upon a time, in a galaxy far, far away … a jedi master had two young and ambitious pupils.” That could have been the beginning of the Star Wars fan film Reign of the Fallen, except that this film has a bit more class and style than that. In a world where too much is governed by greed and financial power, it is in equal parts fascinating and invigorating that a concept such as fan film is allowed to thrive, or at least to live. Fan film is like fan fiction, only on the screen. But while fan fiction requires nothing but a devoted mind and a computer (or pen and paper, for that matter), a fan film by necessity needs at least a skeleton staff, a lot of time for pre-production, shooting and editing, and usually also some fairly expensive equipment. In theory, of course, a fan film needs be no more sophisticated than Tarzan and the Rocky Gorge (1936), but a lot more is required if it wants to be taken seriously. Even the best fan films are often amateurish in many ways. The actors are usually not very good, and special effects can sometimes look comically bad. Of course, this is part of the charm: The film makers actually manage to complete a film of considerable length in spite of their limitations, and the results can be endearing; even enjoyable. Reign of the Fallen is no exception in this regard. However, unlike many other fan films, it does not suffer from its amateurish aspects to any greater extent, because it places very little emphasis on acting and special effects anyway. Here, the main focuses are the script and the photo. And both are of high quality, better than some professional films. In fact, the film is extremely beautiful at times. Also, the music is excellent. Reign of the Fallen is set on the distant planet Prias. The Sith wish to increase their influence, but there is a way to stop them, if only one of the Jedi master’s pupils can find an ancient artefact and use it against the Sith. Such is the basic plot, but there is a lot more depth to it once the story is set in motion. This film is best enjoyed by true geeks. Even in spite of its qualities, it is doubtful if it holds enough to be interesting in itself, without the scope of the entire Star Wars phenomenon to augment it. If you are a Star Wars geek (you know you are), watch it on May the fourth, Star Wars Day. In his essay “Son of Dr. Strangelove, Or, How I Learned to Stop Worrying and Love Stanley Kubrick,” sci-fi author Arthur C. Clarke writes about the work that lead up to the classic movie 2001: A Space Odyssey (1968). Among other things, Clarke mentions that he first met with Kubrick to discuss the project on April 22, 1964 – exactly 50 years ago tomorrow. Kubrick was right and he was wrong. Things to Come does have its share of weaknesses, as does 2001. But in the end, both are classics in the genre, and both deserve that status. The two films actually have more than that in common. Both were born out of a cooperation between the most important living science fiction writer of the time (H. G. Wells for the earlier film) and one of the best directors (Alexander Korda, although he did not direct Things to Come; he only produced it). Both films are in some ways highly prophetic and, more to the point, try to convey important messages that are still relevant today. Things to Come is divided into three sections. 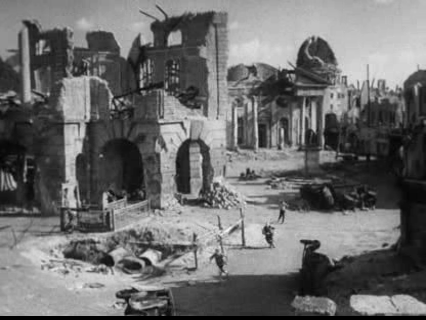 The first prophecies World War II (which begins in 1940 in the film) and is clearly anti-war. The second section deals with the world in the 1960s. The war never really ended, but civilization is in shambles and there is no central government. Local warlords fight for whatever remains. This part of the film makes it one of the first post-apocalyptic films, perhaps the first where a large part is dedicated to survival in the world after the apocalypse. In the final section, we see the new world of 2036, typical of Wells, who was a firm believer in the wonders of technology, and how they could bring peace and wealth to the world, if used wisely. This part fascinates mainly because of its excellent sets and special effects, many of which still impress. Things to Come is a splendidly effective and well-produced film, full of beautiful imagery and fascinating ideas. The film does have one major problem, however, in that it follows Wells’ script too closely. Wells, while one of my favourite SF authors, was always very didactic, which could sometimes give a rather stiff air to his books. In the movie, this shines through even more clearly, leaving in part a stilted, pompous and unnatural dialogue. Wells’ detailed synopsis for Things to Come has been published, and actually reads better than it comes through in the final film. There are several versions of this film, all cut and incomplete to various extents. At least two are available at the Internet Archive. In this post, I mainly link to a version distributed in America, but there is also another version, slightly longer and with better resolution, but unfortunately the copy is very dark. I understand that the copyright status of this film has been in question, and according to Wikipedia it is under copyright in the UK and the rest of the EU, but apparently not in the US. Whether you decide to download it or not is, of course, a matter for your own conscience. This film is best enjoyed by those who, unlike Stanley Kubrick, realize that a film can have a few faults and still be brilliant. Earlier this year, I noted that it was 100 years since Charlie Chaplin started his acting career. At that point, he was almost 25 years old, which also makes this the 125th year since his birth. His birthday is on Wednesday, April 16, and should properly be celebrated with a classic Chaplin film. Why not one of his best, such as The Kid. Up to the point of making The Kid, Chaplin’s films had all been short slapsticks. Usually only a single reel, and never more than about 40 minutes in length. His output had initially been enormous (about 20 films as a director in 1914; almost double that as an actor), but the number of new annual releases had decreased as quality had increased. But even though his films became better and better, they were still fairly simple in terms of plot. Chaplin did deal with social themes in many early films but, comparatively speaking, there was not much depth in them. But Chaplin was not satisfied with making pure slapstick any more. The Kid took over a year to produce (partly because it was delayed by Chaplin’s divorce from his first wife), and became his first full-length feature. It was a great success, and still remains one of Chaplin’s most loved films. I personally hold it as my favourite Chaplin. The story is not very complex on the surface. Chaplin, as his tradmark tramp character, finds an abandoned baby. Though he is reluctant to take on the role as father, circumstances force him to keep the child and bring it up as his own. From this basic story, Chaplin weaves his magic. There are many little subplots and a good deal of Chaplin’s well-paced slapstick humour. There is also an abundance of warmth and compassion, yet it never becomes pathetic. In this post I mainly link to the original and complete version of the film. At the Internet Archive there is also an edited version with high resolution and a good soundtrack, though cut down by about a quarter of an hour. Unfortunately, I suspect that this other version is under copyright. 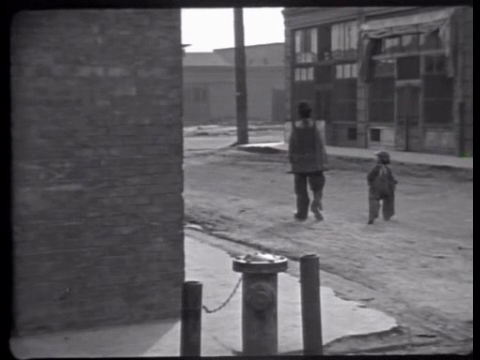 This film is best enjoyed for the excellent interaction between Chaplin and Jackie Coogan as the kid. Through the film, Coogan became the first celebrated child actor, and it is easy to see why. Tomorrow, Mars reaches opposition to the sun, as seen from the earth. It does so about once every two years, and this is the time when it can most easily be observed by the human eye and amateur telescopes. In the mid 20th century, many still thought that Mars was capable of harbouring advanced life, and Mars and the Martians often appeared in films in the 1950s and 60s. Producers of movies such as Flight to Mars also mistakenly believed that an opposition was the perfect time to send a spaceship to Mars. 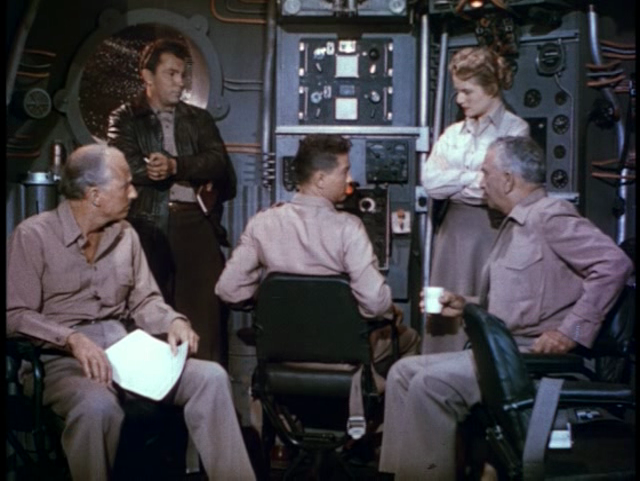 Flight to Mars is one of the many science fiction movies that were produced in the wake of Rocketship X-M. An amusing detail is that it even reused much of the spacecraft interiors from the 1950 film. If you look closely you can see that the rightmost panel in the image below is the same as the leftmost one in the first screen shot I used in my Rocketship X-M review. The first half of he film is very simple in terms of story. A rocketship is going to Mars, and a team has been put together to pilot it. We get some early glimpses of the different personalities and their varying reasons for wanting to make the journey. In movies, as well as in literature, a template seems to exist for the archetypal exploration story. 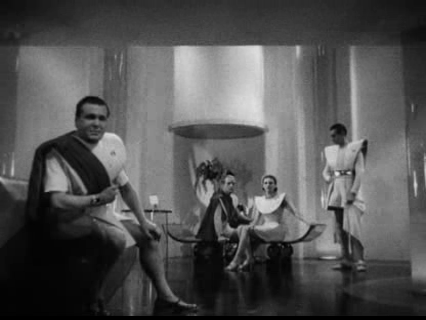 Whether it is about exploring a hidden jungle (as in the 1925 adaptation of The Lost World), going into the interior of the earth (Unknown World from the same year as the subject of this post) or travelling into outer space, there is always a team of about half a dozen people, one of whom is the scientist who came up with the idea. There is usually also a newspaper reporter and there is exactly one woman, so that there can be a romantic interest for the hero. Flight to Mars is no exception to this. After the initial half hour’s trip to Mars, however, the film goes off in new directions and becomes much more interesting after the ship’s arrival to the red planet. This part is probably inspired by the Russian film Aelita (1924), which will doubtlessly appear on this blog sooner or later. 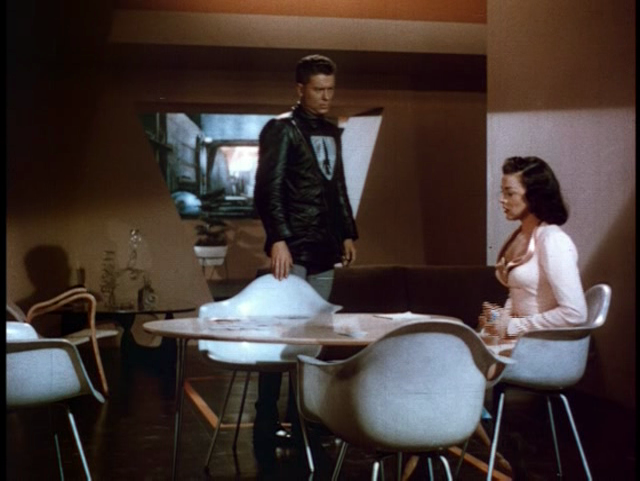 This film is best enjoyed if you are interested in corny sci-fi architecture and fashion. Both clothes and buildings seem awfully impractical (“We find these [clothes] very comfortable.”), but they certainly are evocative. Also, the men’s leather jackets produce a never-ending stream of farting noises that are rather amusing.